T’is the season for apples, and I love finding new ways to use them in Trim Healthy Mama-friendly meals! This Apple Cake In A Mug is a delicious way to enjoy them in an E setting for breakfast, a snack, or dessert after an E meal. Apples are always considered an ‘E,’ or an energizing source of healthy carbs. Paired with a very lean source of protein and low (approx. 1 teaspoon or less) to no fat in a serving, they stay an E. Add any more fat, and you have a Crossover. 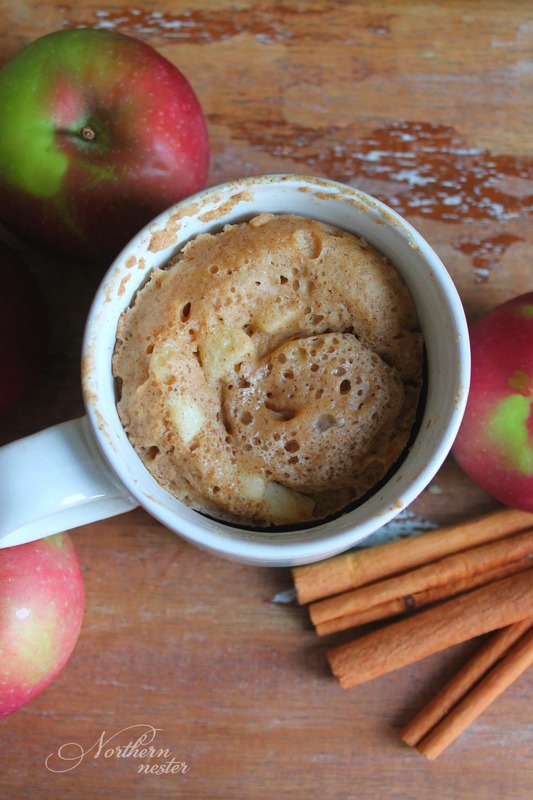 This Apple Cake In A Mug is a Trim Healthy Mama ‘E,’ because it contains protein from the egg whites, more healthy carbohydrates from the oat flour, and a few other “neutral” ingredients that give it rise and flavor. Apple Cake In A Mug is amazingly light and tender, especially considering how dense oat flour can be. This is achieved by using plenty of moisture in the amount of egg whites, which also double as the protein source. The apples themselves (I prefer using a sweeter apple like Gala, Honeycrisp, or Golden Delicious for this cake) also add a great deal of flavor and keep the cake from being too dry. It can be tricky coming up with good desserts to enjoy after an E meal that keep you an E mode; this Apple Cake In A Mug is a wonderful option and can be made even more delightful by drizzling on some Nature’s Hollow sugar-free maple syrup, or garnishing with a squirt of fat-free Reddi-Whip. You will never guess that there is no fat source in this light and tender Apple Cake In A Mug! A wonderful, single-serve THM E that you can enjoy for breakfast, a snack, or dessert after an E meal! Stir egg whites, oat flour, sweetener, vanilla, baking powder, cinnamon, and salt together in a mug until frothy and well blended. Stir in diced apple (I prefer using a sweeter apple like Gala, Honeycrisp, or Golden Delicious). Microwave in a large mug for approx 1 - 1.5 minutes, or until cake is no longer runny. Enjoy as is, with a squirt of fat-free Reddi-Whip, or a drizzle of sugar-free Maple Syrup. Try swapping out the apple for peaches, or pears instead! Looking for more on-plan ways to use apples? We love these E treats, too! Hi Jacinda, thanks so much! This looks truly yummy! Can i check is oat flour just ground up rolled oats? Thanks again. So good! Had this for lunch today with a couple of wasas and cottage cheese. Just had the Apple Cake in a Mug for breakfast with a cup of Oolong Tea with collagen. It was delicious! Thank you for this recipe. I really enjoyed it!